The Halifax Hoodie by Hey June Patterns – me and this pattern are totally Besties! Woohoo I’m so happy to be posting about these makes. 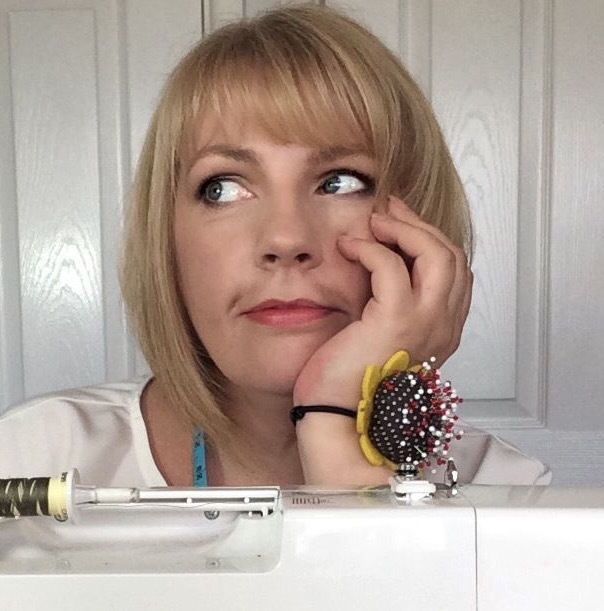 Do you sometimes feel with your sewing that all too often there is an inevitable niggle, big or small; the thing we wished we’d done differently? Or that everything’s ‘right’ but it just feels a bit ‘meh’ anyway? Well, I’m happy to report there is nothing of that ilk here, I absolutely LOVE EVERYTHING about this project! Well, ok, there is one thing but its a teeny weeny thing and really I should drop it already but … in typical fashion, I’m not going to! (So more on that in a bit!) What is it making me All Giddy? Have I made a fancy dress? A pair of tailored pants? Some other labour intensive showstopper? No I have not, I’ve made a Hoodie. But not just any old hoodie…a Halifax Hoodie! And let’s talk about how much pattern you get for your money! The Halifax pattern comes with five quite different looks. Five! From your traditional zip up hoodie, round necked, funnel necked and zipperless versions with a single kangaroo pocket to twisted side seams and the option of a high low hem. Oh and I really like how well their PDF’s come together. I can tell you now, me and this pattern are going to be rockin’ it for some time to come! My second version, complete with gold drawstring, is made in the ‘Twinkle’ navy from the ‘Night’ range of Atelier Brunette French Terry. If you want to take a closer look at that version you can head on over to the Minerva Crafts website HERE to read my post on their Blogger Network (you may need to check back in; it’s due to be in stock again soon; I think Minerva may well have just got their hands on what is potentially the last of what stock might ever be available so my advice would be to not hang about if you want some too!) I’ve just back-ordered more of it in the grey colourway to make a third but really want the pink too! And can you guess from the pic below the thing I wish I’d done differently? Yup, sew the buttonholes for the drawstring cord using gold thread. I even have some for goodness sake! Or that I’d used gold eyelets. I told you it was a teeny weeny thing but clearly I like berating myself! Anyway, carrying on with construction. Considering what fabric you’re going to use; ideally if you’ve got a fabric with a crossways stretch of around 30% you won’t need to factor in extra ease – so you can use fabric with less stretch than this, you’ll simply want to consider sizing up as the pattern is designed with only minimal ease across the chest (1.4” in the size I made). Both of mine are in French Terry but they differ in feel as I say, with The Lips being drapier than the Atelier Brunette. The Halifax is sized for a height of around 5.5” to 5.8” and I’m 5.2”. However I didn’t drastically alter the paper pattern pieces lengthwise for my first make, simply because with View D, you’d only lengthen, or in my case shorten, the pattern pieces from the hem or cuff lines. I knew this was something better determined by trying the garment on during the construction process. I didn’t take anything out of the shoulder width either as I’m likely to wear it as a layering piece. The only thing I did to the pattern pieces before cutting into my fabric was to trace and double the pieces intended to be cut on the fold so I could cut on the single instead. The funnel neck piece in particular, which you would otherwise have to cut on the double fold. I’m not into that kind of pattern Tetris so I cut my funnel neck piece out four times and stuck them together to make one whole. Note also that the pattern pieces are to be laid in relation to the direction of the greatest stretch in your fabric. There is also a pattern piece so you can make your drawstring out of your fashion fabric. As mentioned, I opted to use a ready made cord instead with my Atelier Brunette version because who wouldn’t want a matching gold one when you can have one!? The pattern piece is 45”; I used a metre of cord. Oh and I notched the CF and CB marks of my Bodice and pocket piece. The whole thing came together so quickly! And that’s even taking into account length changes I made whilst constructing and the fact that I tend to sew up everything on my sewing machine, only using the overlocker to finish the seams. I sewed mine pretty much in one sitting. The instructions recommend you use what I think of as a ‘drunken straight stitch’, i.e a lengthened zigzag (2.5mm x 0.5mm) – imagine a straight stitch staggering its way home zig zag style from the Pub, if you will! I used, in sober fashion, a straight stretch stitch. I just feel it’s more robust. Being a titch, I ended up taking out 2” from the sleeve and an inch from the bodice pieces on my first one and a further inch from the bodice on the second. I love the slightly longer length of the first, Lippy Lips one, as it provides enough coverage to throw on atop a pair of leggings (my new Avery Leggings from Helen’s Closet, naturally!) The Twinkle one, being that bit more ‘dressy’ (as far as a hoodie style top can ever be considered dressy!) I like paired with either my skinny or baggy boyfriend style jeans. Time to wax lyrical; I love this pattern to the very core of my being! No exaggeration. Shout out to the lovely Heather of Heather & The Pugs for igniting my love for it with her own fabulous versions! I’ve definitely reached something of a Pass lately; really embracing what I know to be my core ‘style’ (I’m using that word very lightly, obviously!) It’s time to face facts, I feel more comfortable and therefore more confident, dressed down. I think, style wise at least, most days its fair to say I identify more as ‘Awkward Teenage Boy’ than I will ever do as, say, the ‘Middle Aged Woman’ I purportedly am! So there you have it! If you’ve been considering getting the pattern but haven’t yet, I strongly recommend you stop dithering and get on with it, haha! What a great versatile pattern and you’ve made some beautiful versions. A great make using our bit.ly/gclipstick french terry! Halifax Hoodie is definitely one of my favorite patterns! It’s a shame that I never really talked about it… It is such an amazing one. I’ve been using view B for my sweaters and it looks amazing in sweater knit. I love your versions!!! Both of them! And I do love how the color on the “lip” fabric stands up a bit. It gives it a bit of effortless coolness. And the gold… oh, hands down amazing! Speaking to you berating yourself for forgetting to use gold thread, when this happens to me I like to think that I would have surely messed it up if I used gold thread and it would have been very visible. It makes me feel better and a bit more intentional about forgetting… haha but I still think it looks great just the way it is! You look like a million bucks on every photo. Your iterations on this wonderful pattern are very convincing! Great post, love both of them. Think I’ll have to get the pattern!